Fashion in the fifties brought glamour to austerity Britain. Women adopted the New Look of Christian Dior. In the mid fifties, Chanel's simple suit provided an alternative and created a much copied fashion that lasted well into the sixties. When Rock'n'roll came along, young girls stopped looking like their mothers and adopted a more youthful look. Christian Dior dominated fashion in the fifties. He dispensed with the austere look of utility and created the New Look in 1947. Its narrow waistline and wide skirt made women look feminine once more. Dior's garments used large amounts of material; almost considered immoral in the days of rationing. Dior's clothes, like those of other fashion houses, were aimed only at wealthy clients. Most women bought from high street shops which quickly imitated his style. Dior's influence continued throughout the 50s. In 1953, he introduced the Princess Line, and in 1955 the A-line. Skirts were full and wide and bright colours were in. The look was glamorous. Girls aspired to look like movie stars. The Dior look was challenged in the mid fifties when Coco Chanel introduced her new Chanel suit. It was a simple design, featuring a just below the knee skirt and a collarless jacket finished with gold braid. Chanel's suit was much copied by the ready-to-wear fashion houses. It quickly became the standard formal look for women at all social levels. The Chanel style look remained a favourite style for most of the sixties too. Even as late as 1969 in the film, Kes, Billy's mother (Mrs Casper played by Lynne Perrie) wore a Chanel style suit when going out on Saturday night. She was middle-aged rather than young, and working class rather than posh. Hairstyles in the fifties reflected the glamorous look of movie stars. These fabulous styles were achieved using curlers and lots of back combing. Visit http://www.hairarchives.com for a detailed analysis of hairstyles in the 50s and other decades. Women in the 50s had no qualms about wearing fur. Every girl's dream was a mink fur coat. Imitation fur, or fur fabric, was also popular. You could even buy mink coats for a few shilling per week from the tallyman, see left. Fur fabric in a leopard skin pattern enjoyed a brief spell of popularity at the kitsch end of the fashion spectrum in the late fifties (right). Young women started to look less like their mothers in the latter part of the fifties. 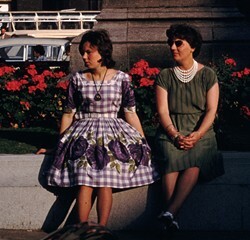 Brightly patterned dresses with tight waists and wide skirts were popular. The effect (right) could only be achieved with a stiff, starched petticoat. This style was suited to Rock'n'roll dancing. 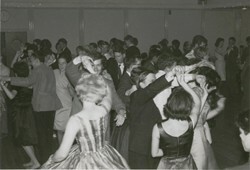 For Rock'n'roll and Jive dancing, the circle skirt, which swirled up reflecting the energy of the dance, was also highly fashionable. These colourful patterned skirts were also worn for more casual occasions (left). This woman's skirt has a very typically fifties picture style pattern. In this era trousers and pullovers were more popular for women. Trousers followed men's fashion with narrow legs, but were usually tighter fitting. Jeans were also becoming trendy for casual wear. 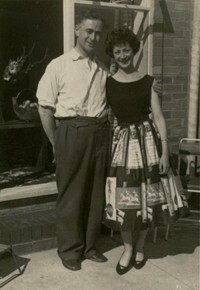 For the most comprehensive survey of fifties fashion on the net, go to http://www.fashion-era.com/1950s.